BEIJING, China, Sporting Alert — Michy Batshuayi scored a brace and Chelsea thrashed fellow English Premier League rivals Arsenal 3-0 in their opening pre-season friendly on the tour of Asia in Beijing, on Saturday. The Gunners, as expected, owned the possession 55 percent to 45 percent, but it was Chelsea who dominated on offense as the reigning English Premier League champions finished with 20 total shots and 11 on target. Arsenal ended with eight total shots, but only one was on target, while their shooting accuracy was a mere 20 percent compared to Chelsea’s 79. 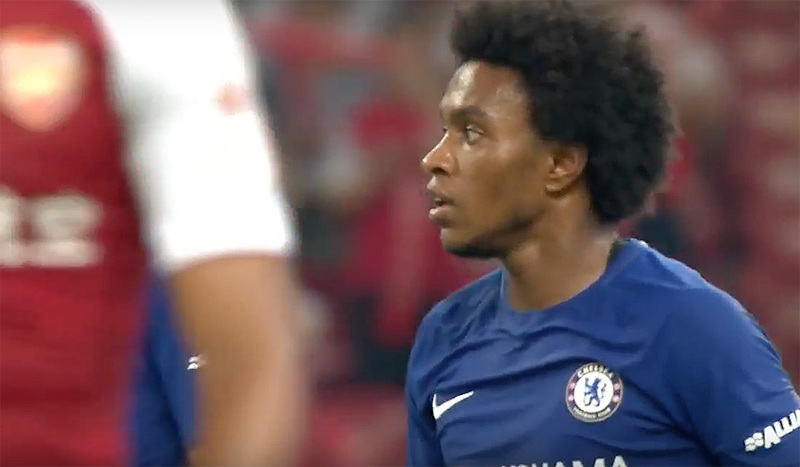 After threatening to break the deadlock early in the game, Chelsea finally grabbed the lead inside a packed Bird’s Nest Stadium when winger Willian netted his fourth goal of the young pre-season for the Blues. Willian, who scored a hat-trick last week in the friendly win over Fulham, picked up a pass from Batshuayi, raced into the penalty area before cutting inside and beating Arsenal goalkeeper David Ospina with a shot that went in off the post. Two minutes later, Chelsea were celebrating again after Batshuayi beat Ospina with a shot that curled away from the keeper. Holding midfielder N’Golo Kante picked up a loose ball in the Arsenal half after the Gunners turned the ball over once again and then found Batshuayi with a well-weighted pass at the edge of the area. The Belgian striker then turned and neatly curled a shot out of the reach of the full stretched Ospina to give Chelsea a 2-0 lead at the break. Shortly after the interval, Batshuayi collected his brace with another sweetly taken goal. A clever play from Chelsea left-back Marcos Alonso, who left Alex Oxlade-Chamberlain for dead on the floor with a cut inside move, rolled a pass for the travelling Batshuayi to fire into the top of the net in the 49th minute and made it 3-0. It was a well-deserving victory for the Blues, who dominated the game and could have scored even more goals.